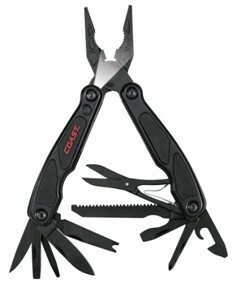 The best (or worst) thing about a multi-tool like the Coast C5799 LED Pocket Pliers is always the pliers. If it includes a pair of pliers that works -- the rest is gravy. Coast provides a good but lightweight pair in the C5799. With average strength and leverage, there are still enough other special features in the C5799 to set it slightly apart from the herd. The basic framework and tool set is made from high carbon 440C stainless steel still used in many common folding knives. Adding rubberized coating to the folding handles helps the grip and gives the tool a more professional look. Folding to only four inches, the tool in its pouch will ride on the belt and out of the way or be a convenient addition to pack or purse. That four inches is a little short if you hope to work on nuts and bolts with the C5799 -- something we all know we shouldn't do with a pair of pliers, but do anyway. Sometimes it's a choice of fixing the car with the wrong tools or walking home. You'll be better off dealing with electrical problems with the Coast LED since the needle-nose jaws and wire cutters are built for that. The rest of the tactical black tool set includes several sizes of flathead screwdriver blades, a Phillips bit, a saw blade long enough to actually work, scissors, knife, file, wire stripper, and both can and bottle openers. The deal-maker will be the built-in LED trouble light, which runs off two small CR1220 batteries and makes using the tool in the dark an easy trick. Many of those three-handed situations will be immediately cut down to two-handed problems you can actually solve. For a multi-tool designed for students and others who need occasional pocket help but aren't allowed to carry knives, see the Leatherman Fuse -- all tools and no cutting edge.